Now, folks, this is serious, because it gets worse. And you won’t be laughing when I finish telling you this. They also want to block-grant Medicaid, and cut it by a third over the coming 10 years. Of course, that’s going to really hurt a lot of poor kids. But that’s not all. 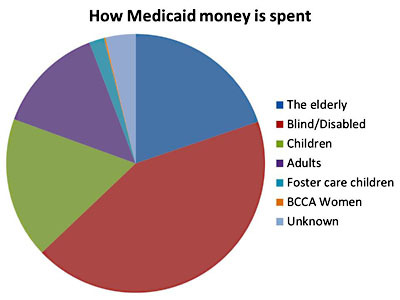 Lot of folks don’t know it, but nearly two-thirds of Medicaid is spent on nursing home care for Medicare seniors who are eligible for Medicaid. It’s going to end Medicare as we know it. And a lot of that money is also spent to help people with disabilities, including a lot of middle-class families whose kids have Down’s syndrome or autism or other severe conditions. And honestly, let’s think about it, if that happens, I don’t know what those families are going to do. Clinton’s specific number is apparently wrong. According to Sarah Kliff, about 40% of Medicaid dollars are spent on nursing home care for seniors, not two-thirds. But Clinton’s primary point remains true: at the same time that Romney/Ryan would squeeze Medicare, they’d also squeeze the very program that takes care of the elderly who’d be hardest hit by the cuts. This backstopping function is one reason that Medicaid is a surprisingly popular program: it doesn’t just help the poor, it also helps the elderly and the disabled, and is therefore a lifeline for a lot of middle-class families. It’s worth making a little more noise about.